Struggling to raise funds for a new cathedral, a preoccupied young clergyman has neglected his loving wife Julia, and now only divine intervention can save their marriage! But the powerful and handsome angel sent from above has a mind of his own and teaching mortal Henry an immortal lesson in romance isn’t all he’s got planned! Why would AMC air this movie at such inconvenient times when most people are unable to watch it? I love this movie and the Preacher’s Wife! Great movies, acting was superb and it makes Christmas feel like warmth and love!! 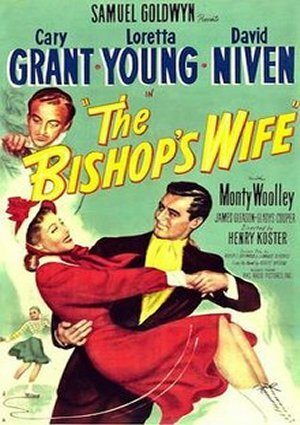 The Bishop’s wife gets you in that old Christmasy feeling. You wish things were like that today. Cary Grant is the best actor of all time. He makes this movie truly special. I love this movie! I watch it every year.